Dolmans were outdoor garments designed to be worn over the fashionable bustles of the 1870s and 1880s. This one is designed so the back would sit comfortably over even the most extreme bustle shape of about 1885. 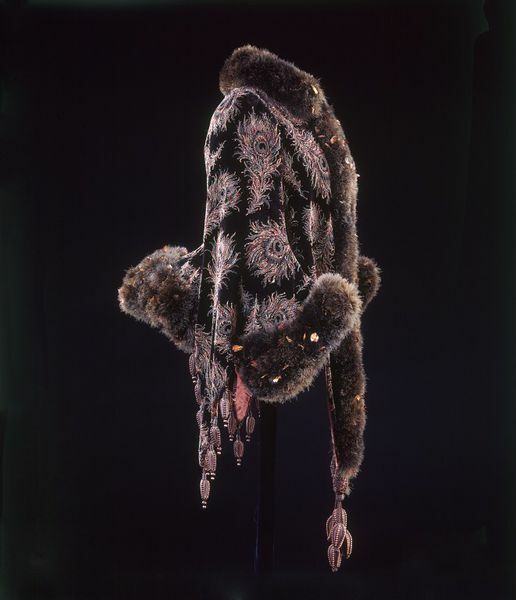 The front, back and sleeves are trimmed with exotic marabou feathers made into wide bands and interspersed with small, flat feathers, probably from some type of domestic fowl, and dyed to a lighter tone. This gives a interesting almost sparkle to the trimming as the flat feathers catch the light. Heavy wooden braid-covered pendant tassels are used to trim the pointed panels of the garment. The weight of these provides a contrast to the lightness of the feather decoration and would help to keep the panels hanging straight when the dolman was being worn. Peacock feathers were a popular design motif in the 1860s to 1880s. 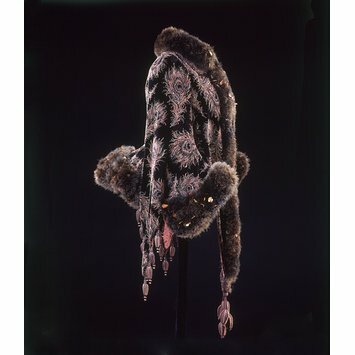 Marabou trimming, obtained from the downy underwing feathers of the marabou stork became particularly fashionable in the second half of the 19th century. These birds were native to most part of the southern two thirds of Africa. Their downy feathers could be dyed any colour required and fashioned into long ropes of luxurious trimming, almost fur-like in appearance, as illustrated on this garment. Dolman mantle of cut and uncut velvet with a feather trim and braided pendants tassels for decoration.